The cervicothoracic junction (CTJ) is often inadequately visualized on lateral cervical X-rays due to anatomic variations and technical factors. The aim of this study was to investigate whether the swimmer’s view and arm traction could enhance the image field on the standard lateral cervical (SLC) X-ray. The study was conducted in a university hospital in October 2007 with 40 volunteers. SLC X-ray, lateral cervical X-ray in the swimming position, and lateral cervical X-ray with arm traction were performed in the supine position. The enhancements in the image fields were analyzed. There was a statistically significant difference for the increases in the view of cervical spines between SLC X-ray (12.60 ± 7.48) and either lateral cervical X-ray with arm traction (21.73 ± 9.78; p = 0.000) or in the swimming position (21.20 ± 14.19; p = 0.001). Both arm traction and swimming position increased the field of view by approximately 9 mm. Increased visualization of the cervical spine occurred for 24 of the 40 participants using the arm traction view (60.0%) and 23 participants (57.5%) using the swimming position view—results found to be statistically similar according to the ≥ 1/3 caudal vertebral height visualized (p = 0.902). Using the lateral cervical X-ray view, the number of cervical vertebrae visualized differed according to body mass index (BMI)—seven cervical vertebrae were visualized in participants with a BMI < 25 and six vertebrae were visualized in participants with a BMI ≥ 25 (p = 0.007). Lateral cervical X-rays with arm traction and swimming position enhance the view of SLC X-rays. An initial SLC X-ray including the lower third of the cervical spine (with C7), arm traction, and swimming position may be beneficial in visualizing the CTJ. However, patients with an increased BMI are unlikely to benefit from all three methods. For patients presenting with multiple trauma to the emergency department (ED), advanced trauma life support (ATLS) guidelines recommend that lateral and anteroposterior cervical X-rays should demonstrate a complete visualization of: (1) all cervical vertebrae, (2) the cervicothoracic junction (CTJ), and (3) the first thoracic vertebra . The misdiagnosis of cervical spine injury may have terrible consequences, particularly in the cervicothoracic region, where 9–18% of cervical spine injuries are seen [2–4]. However, the CTJ is often inadequately visualized on lateral cervical X-rays due to anatomic variations and technical factors. Body mass index (BMI) and the length of the neck and shoulders are the major anatomic factors leading to insufficient view of the CTJ [5, 6]. Traditionally, the swimmer’s view or arm traction is used in these cases . Physicians also use the oblique view in clinical practice when the standard view is insufficient. Computed tomography (CT) and magnetic resonance imaging (MRI) are ultimately used in the cases in which X-rays have failed [7–9]. This study is a comparison of the SLC view with the arm traction view and swimming position view. The study was conducted in a university hospital in October 2007. The study population comprised volunteers from the ED staff, including physicians, nurses, and paramedics. Informed consent was taken from all volunteers. The local Ethics Committee approved this study. The exclusion criteria were pregnancy or suspicion of pregnancy, a history of cervical spinal trauma or operation, and refusing to give informed consent. Initially, demographics, body weight and height, length of the neck, and the distance between the two shoulders were recorded for each volunteer. Sternomental distance (SMD) was used in order to determine the length of the neck. The distance between two acromions—biacromial distance (BAD)—served as a measure of the distance between two shoulders. SLC X-ray, lateral cervical X-ray in the swimming position, and lateral cervical X-ray with arm traction were performed in the supine position for each volunteer. 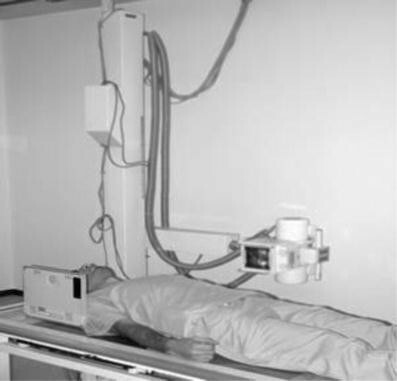 The supine position was preferred because the typical trauma patients will usually undergo X-ray in the supine position instead of standing up. Cervical X-rays were taken by a radiology technician with 20 years of experience. An assistant professor of radiology and the research assistant from our ED accompanied him. 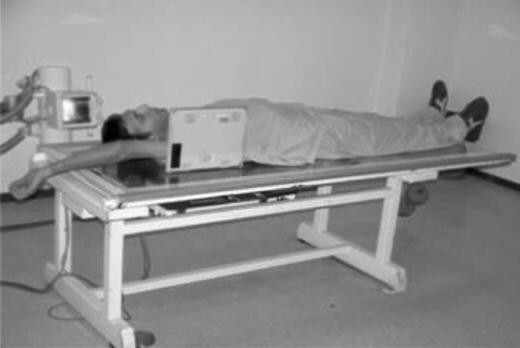 Study participants were placed on the X-ray table in a supine position with complete contact of the head with the X-ray table. The X-ray film cartridge was placed to the right side of the participant’s head and at 4 cm superior to the ear pinnacle. The central X-ray source was located perpendicularly to the film cartridge at the approximate level of the fourth cervical vertebra. The SLC X-rays used a standard dose of radiation within a time interval of 0.08–0.12 ms, using 65–70 kW of voltage and a current of 100 mA. The position of the study participants and placement of X-ray source and film cartridge during the SLC X-ray are shown in Fig. 1. Four kilograms of weight were fixed onto both arms over the elbows. The weights were hung down the end point of the X-ray table through the feet of the patient (Fig. 2). The X-ray machine and film cartridge were placed similarly to the SLC X-ray and the same doses were used. We believed that the weight placed over the elbows would be effective in overcoming the opposing resistance from voluntary muscle contraction. Patients were placed in the supine position with the right arm placed overhead with full extension of the shoulder and the left arm undergoing traction caudally. The film cartridge was placed under the axilla on the right side with the superior edge of the cartridge located 4 cm superior to the ear pinnacle. The X-ray source focused on the CTJ (level between the seventh cervical vertebra and first thoracic vertebra). A standard dose of radiation was used, within a time interval of 0.12–0.16 ms, using 65–75 kW of voltage and a current of 150 mA. Figure 3 shows the position for the lateral cervical X-ray taken in the swimming position. All X-rays were taken with the Toshiba TF-6-TL-6 machine from 100 cm distance using cartridges with a size of 24 × 30 cm. Lateral cervical spine X-rays were performed in all subjects with the SLC view, arm traction view, and swimming position view, with the heights of the lowest vertebra measured in each case. The vertical height of the SLC view was then compared with that of the arm traction and swimming position views. The lowest point seen in the X-rays constituted by the superior edges of the clavicle or soft tissue was accepted as the reference point for all three views. Patients were also categorized according to whether an enhanced view of the cervical spine was obtained—with visualization of more than one third of the lowest cervical vertebral body. If the visualization was less than this height, the view was considered not enhanced. All of these X-ray evaluations and measurements were performed by a radiologist aware of the study but blinded to study subjects. The study data were analyzed in SPSS 10.0 for Windows. Continuous variables were expressed as mean±standard deviation and ordinal variables expressed as median and minimum-maximum. Comparisons of two groups with normal distribution were performed by Student’ t test. The Mann-Whitney U test was used for two group comparisons without normal distribution. Related samples with normal distribution for two groups were analyzed by the related t test and dichotomized variables with the McNemar test. Normal distribution was tested by the Kolmogorov-Smirnov test for sample sizes over 30 and Shapiro-Wilk if sample sizes were under 30. All of the hypotheses were constructed as two-tailed and an alpha value of 0.05 was accepted as significant. The study population was composed of 40 volunteers. The mean age of the participants was 30 ± 4.9 with a range of 20–44 years and 60% (n = 24) of them were male. The weight, height, BMI, SMD, and BAD of the participants are displayed in Table 1. There was a statistically significant difference for the increases in the view of cervical spines between SLC X-ray (12.60 ± 7.48) and either lateral cervical X-ray with arm traction (21.73 ± 9.78; p = 0.000) or in the swimming position (21.20 ± 14.19; p = 0.001) (Table 2). Both arm traction and swimming position increased the field of view by approximately 9 mm. Direct comparison of increased vertical height between the arm traction and swimming position views showed no difference in increased visualization (p = 0.841). Increased visualization of the cervical spine occurred for 24 of the 40 participants using the arm traction view (60.0%) and 23 participants (57.5%) using the swimming position view—results found to be statistically similar (p = 0.902) (Table 3). For the arm traction and swimming position views, there was also no difference between groups showing or not showing an enhanced view—defined earlier in this paper as visualization of more than one third of the lowest cervical vertebral body—according to age, gender, BMI, SMD, and BAD (Table 4). Fifty percent of participants had a normal BMI (BMI < 25). Using the SLC view, the number of cervical vertebrae visualized differed according to BMI—seven cervical vertebrae were visualized in participants with BMI < 25 and six vertebrae were visualized in participants with a BMI ≥ 25 (p = 0.007) (Table 5). The caudal endpoint for vertebral height for this study was either soft tissue opacity or the clavicle. However, vertebral bodies below the clavicle were visualized in 15 patients (37.5%) using the swimming position view, with over 70% (11/15) of these participants having a normal BMI. No images showed vertebral bodies below the clavicle in participants using the arm traction view. Posterior structures could be visualized in all arm traction images and in 35% (14/40) of swimming position images. Visualizing the CTJ by SLC X-ray remains a challenge in trauma patients. Lateral cervical X-rays with arm traction and swimming position are suggested by this study as an effective alternative to visualize the CTJ in these patients. Our results demonstrate that both arm traction and swimming position views have been found to increase visualization of the cervical spine by an average of 9 mm. Both views have also been shown to increase visualization of more than one third of the caudal vertebral body in more than half of the participants. While both arm traction and swimming position views hold benefit with better visualization, each view has been shown in our study to have unique advantages. The swimming view achieves visualization below the clavicle in some participants (38%). This view also visualized posterior structures—crucial in the evaluation of trauma patients—in roughly the same proportion of participants (35%). However, the arm traction view appears to be much more effective in visualizing the posterior structures, as it did in all participants in our study. BMI does not restrict the advantages of both methods according to the results of this study. However, BMI was revealed as a limiting factor in the image field of SLC X-ray. The median cervical spine level seen in SLC is the sixth vertebra in patients with high BMI and seventh in patients with normal BMI. However, only 9 mm of additional vertical height is added with the use of arm traction or the swimming position. In this situation, all three methods, SLC X-ray, arm traction, and swimming position, are likely to be insufficient in patients with high BMI who present to the ED with trauma. CT or MRI should be alternative imaging methods in these patients as an initial choice. And also the vertebral bodies below the clavicle are more likely to be seen during the swimming position in normal patients than in patients with high BMI. Previous evidence in the literature is somewhat limited and results varied. A few studies observed the effects of arm traction on imaging of the cervical spine. Bowe et al. found that traction enhances the view of the cervical spine for more than two thirds of a vertebral body . Ohiorenoya et al. reported that unless an initial cervical spine radiograph includes the upper one third of the body of the seventh cervical vertebra, the probability of attaining the C7/T1 level with arm traction is <15% . Our results approximate the results of a previous study by Ireland et al., which reported that 37% of patients imaged with the swimming position view showed visualization of the posterior structures . A recent retrospective study by Rethnam et al. showed inadequacy of the swimming position in visualizing the CTJ . However, their study did not evaluate the possible factors affecting the view of these techniques. And the basic view of patients obtained with SLC X-ray had not been regarded in their study. Traction techniques have also been observed in the literature. Bowe et al. compared different traction techniques to SLC X-ray  and found improved visualization with manual traction alone and accompanied by inspiration and expiration. Interestingly, the study also found that traction using weights of over 18 kg did not improve visualization using the arm traction view. Boger and Ralls described an auto-traction device for radiography of the lower cervical spine. They used a belt attached to the wrist of patients and patients pulled this belt with their feet . Norris et al. compared a traction device to manual traction . Arm traction with weights used in our study showed benefit in increasing visualization. 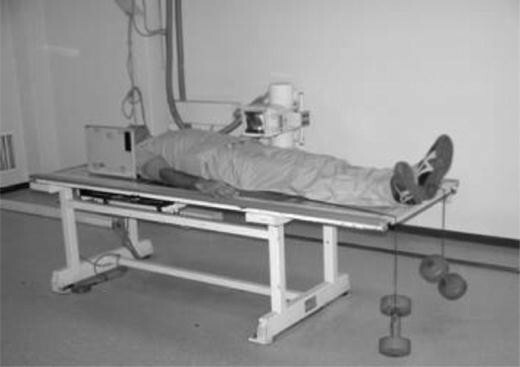 This technique also holds additional benefit, as it may lower the burdens of time spent and radiation exposure inherent in providing manual traction for trauma patients. Another finding of this study is that the length of the neck and the size of the shoulders do not affect the results of lateral cervical X-rays taken with arm traction and in the swimming position. There are some limitations to this study. The sample size is small and should be increased for more accurate subgroup analyses. Another limitation is that participants in our study did not use a cervical collar. However, patients who present to the ED needing cervical spine imaging are often the victims of trauma, who typically have a cervical collar placed when they present. Further study should observe patients wearing a cervical collar. Lateral cervical X-rays with arm traction and swimming position enhance the view of SLC X-rays. An initial SLC X-ray including the lower third of the cervical spine (with C7), arm traction, and swimming position may be beneficial in visualizing the CTJ. However, patients with an increased BMI are unlikely to benefit from all three methods. The swimming position offered some visualization of the posterior structures and thoracic vertebral bodies in some participants. Arm traction demonstrated visualization of posterior structures of all participants imaged. This study was supported by Akdeniz University Foundation. And great thanks to Dr. Joshua Schiller for his contributions to the article.